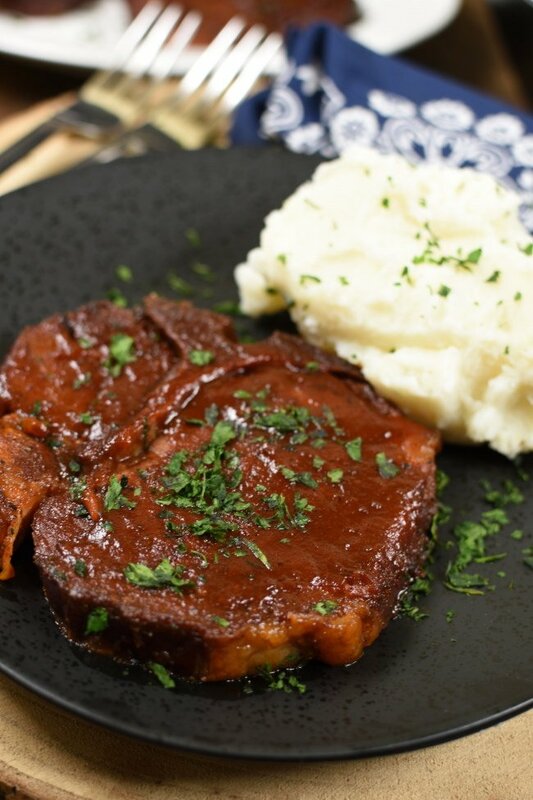 Slow Cooker Barbecue Pork Chops with Mashed Potatoes is the perfect meat and potatoes kind of meal! The pork chops are fork tender, falling off the bone, yet they’re still moist and packed with flavor! Serve them a side of creamy Idahoan® Mashed Potatoes to round out the meal! My boys raise pigs for our local county fair every summer and we always raise a couple extra pigs, so we have enough pork in the freezer for the rest of the year! We love all the cuts of pork meat, but the pork chops are so easy to throw in the slow cooker, so we go through those quickly! In the summer we throw them on the grill, but in the winter Slow Cooker Barbecue Pork Chops are the way to go! This is the easiest dinner in the world to make and everyone loves it!! I’ve told you before that my family is a meat and potatoes family! I used to feel a bit guilty because I’m really not very good at side dishes. Sides almost always consist of potatoes in one form or another. I guess that makes sense since we live in Idaho! We love our taters and my kids go crazy for them so, I’m not going to feel bad about serving them at every meal! Somedays just seem to get away from me and I end up with a slow cooker full of pork chops and nothing to serve with them! That’s when it’s extra handy to have a few packages of Idahoan Mashed Potatoes in the pantry! They’re still made with 100% Idaho potatoes. It’s the real deal, same creamy texture and all, without all the peeling! There you go! Sides are as easy as that! You can use a store-bought barbecue rub if you’d like, but we love this one! It only takes a couple minutes to throw together and I really like knowing exactly what’s in my dry pork rub. Besides that, it’s so much less expensive to make it yourself! Pat the pork chops dry, then rub both sides with the dry rub. Layer the chops in the slow cooker, drizzling a little bit of barbecue sauce over each layer as you go. If you’re feeling ambitious you can make your own Homemade Barbecue Sauce, or you can use prepared barbecue sauce. One of my very favorite slow cooker tricks is to assemble everything and add it to the slow cooker ahead of time. All that’s left is setting the slow cooker on it’s base when you’re ready. It makes mornings, mid days, afternoons, whenever you prep for dinner smooth! Basically, I rub the meat, layer it in the slow cooker, and drizzle it with barbecue sauce. Put the lid on. At this point the slow cooker can be set right on the base to start cooking right now. Or, you can put it in the fridge for later. 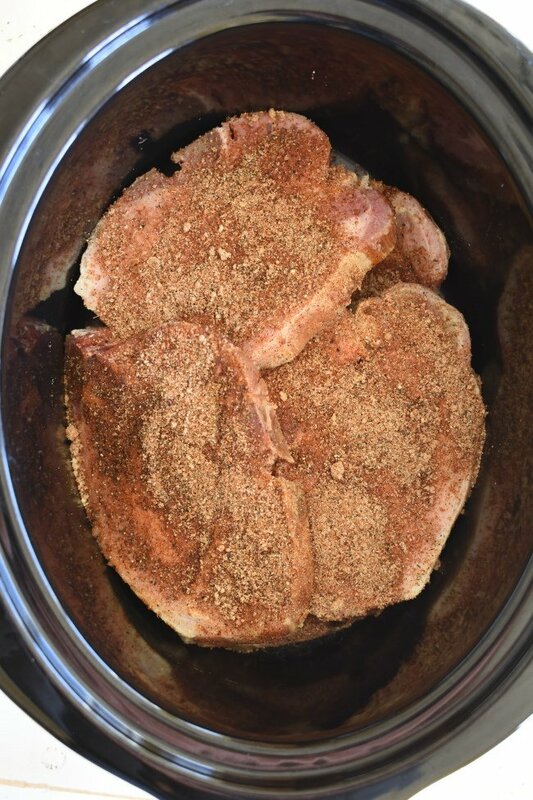 Cook pork chops in the slow cooker on high for 3-4 hours, or low for 5-6 hours. 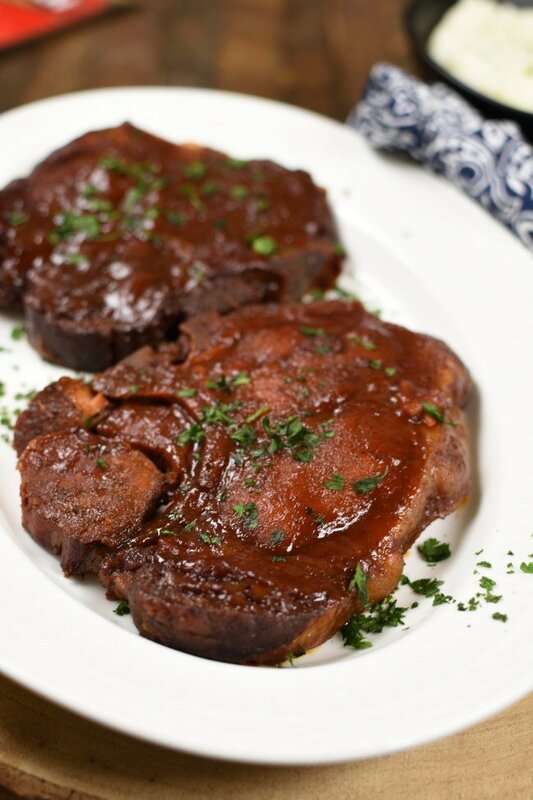 Don’t we all love that gorgeous, sticky barbecue sauce coating on the top of the pork chops? It’s so easy to do and worth the couple extra minutes of effort! Remove pork chops from slow cooker and set them on a baking sheet. Lining the sheet with aluminum foil makes easy cleanup. Add a little BBQ sauce to a dish, then baste the tops of the chops with a generous coating of sauce. Stick about 6 inches from the broiler for a minute. It will give the chops that extra boost of barbecue flavor! FYI, the top layer of pork chops in the slow cooker will be darker than the bottom layers. 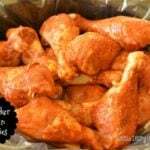 They’re still decicious and sometimes even more flavorful because all that dry rub sticks right to them! Sprinkle the BBQ chops with a little chopped parsley to give them a little freshness and a pop of green color. 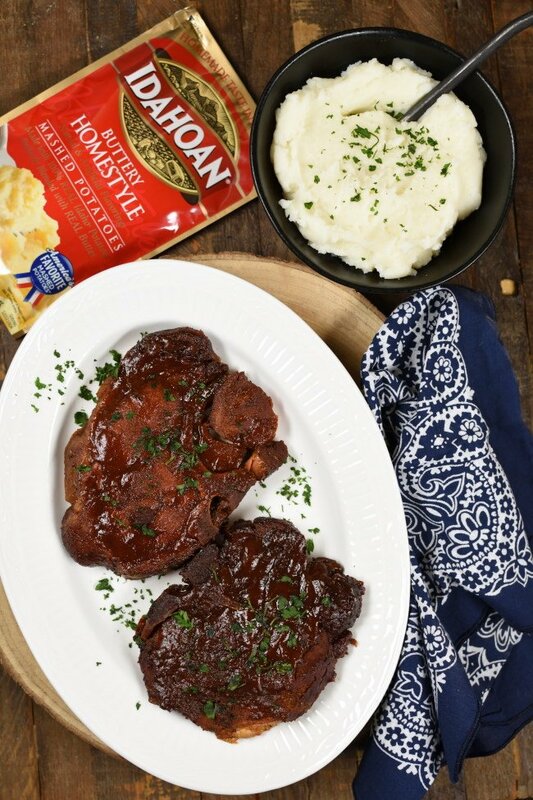 I already told you we like these pork chops best served with Idahoan Mashed Potatoes. You just can’t beat real potatoes, that are real easy! Did you know there are lots of varieties to choose from; Buttery Homestyle®, Butter and Herb, Bacon & Cheddar Chipotle, Roasted Garlic, Four Cheese, and Buttery Golden Secrets! Go ahead and switch your side game up with all these different flavors! We’re all about the cheesy variety! Here are a few other side dish ideas for you! 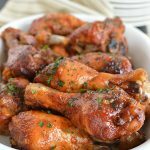 Now that you have Slow Cooker Barbecue Pork Chops ready to go you might have time and want to up your side dish game! Here are a few of our favorite easy sides! 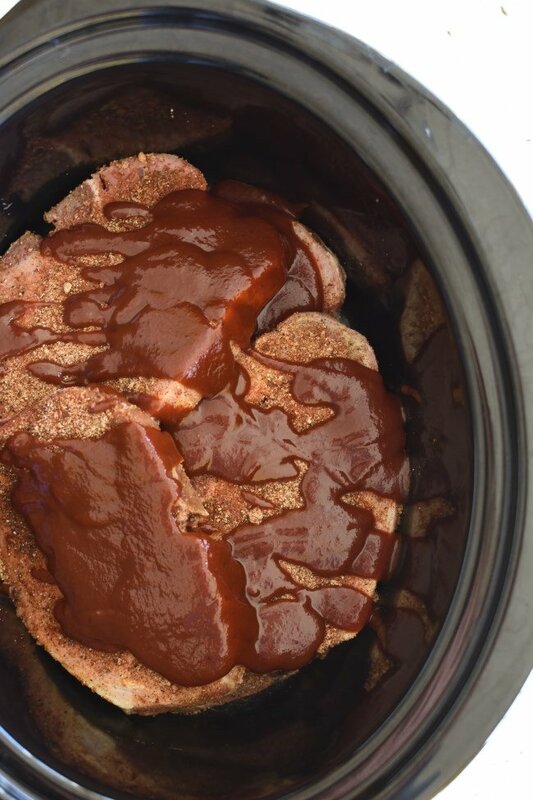 Slow Cooker Barbecue Pork Chops is an inexpensive family friendly meal! You guys know how important family meals are to me. Sitting down all together and enjoying each other is the highlight of my day! There are days however, when my kids trickle in one at a time and then they’re off, headed in their own direction. 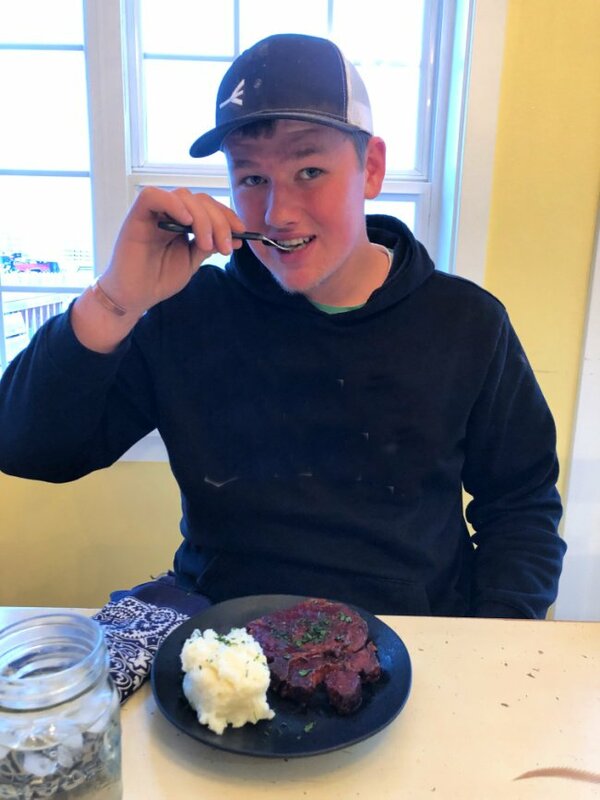 Sometimes it’s because we do shift work on the farm, and sometimes it’s because two of my kids are teenagers and they always have somewhere to go! Even though we miss out on family meal time, I do enjoy taking advantage of that one on one time I get when they eat in shifts. It takes all day to feed them when they are staggered, but it’s a bit like a little date with each one of them and I’ll take that all day long! 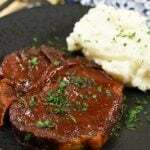 Grab the Slow Cooker Barbecue Pork Chops with Mashed Potatoes! Grab your family, gather around, and enjoy dinner tonight! 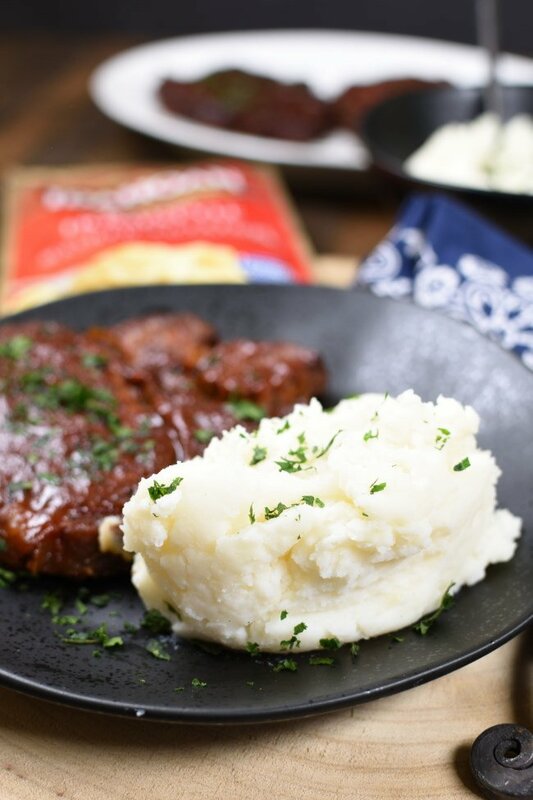 Slow Cooker Barbecue Pork Chops with Mashed Potatoes is the perfect meat and potatoes kind of meal! The pork chops are fork tender, falling off the bone, yet they’re still moist and packed with flavor! Serve them a side of creamy mashed potatoes to round out the meal! Mix all seasonings together, except parsely. Rub both sides of pork chops with dry rub mix. Layer pork chops in slow cooker and drizzling a little barbecue sauce over each layer. Save about 1/4 cup of barbecue sauce for basting. Remove pork chops from slow cooker and set on a baking sheet. Baste with remaining barbecue sauce. Broil about 6 inches from the broiler for about a minute, or until glossy and sticky. 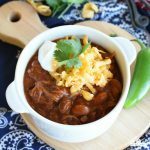 So easy using a slow cooker! Perfect for when life is too crazy to cook. Looks amazing! Yes! 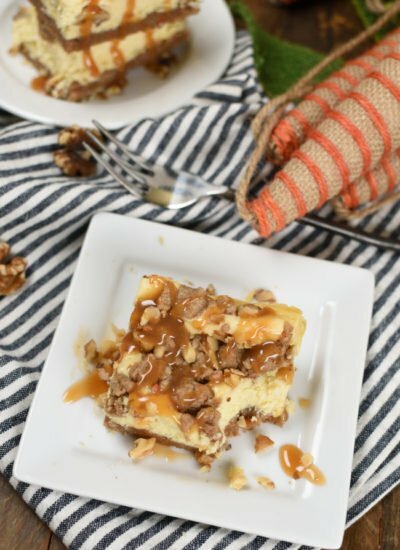 The slow cooker makes crazy days so much easier! All that’s left is whipping these mashed potatoes together! Yum! I am salivating looking at your pictures, wow! Can’t wait to try this. Thank you! I can’t wait for you to try it! 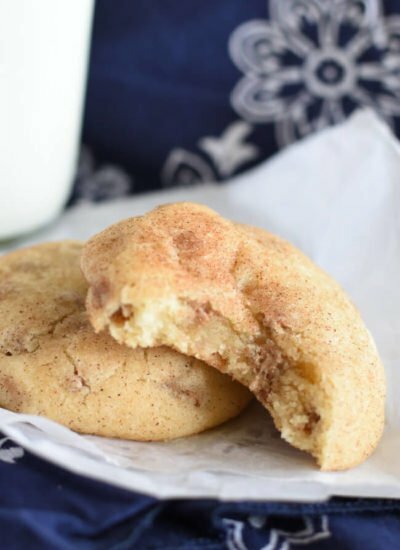 These look so delicious and I love that you make them in the crock pot! 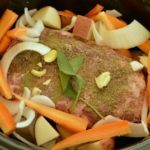 The slow cooker is the easiest way to make dinner! Love that these pork chops are made in the slow cooker! So easy and delicious! Dinner really never has been easier! 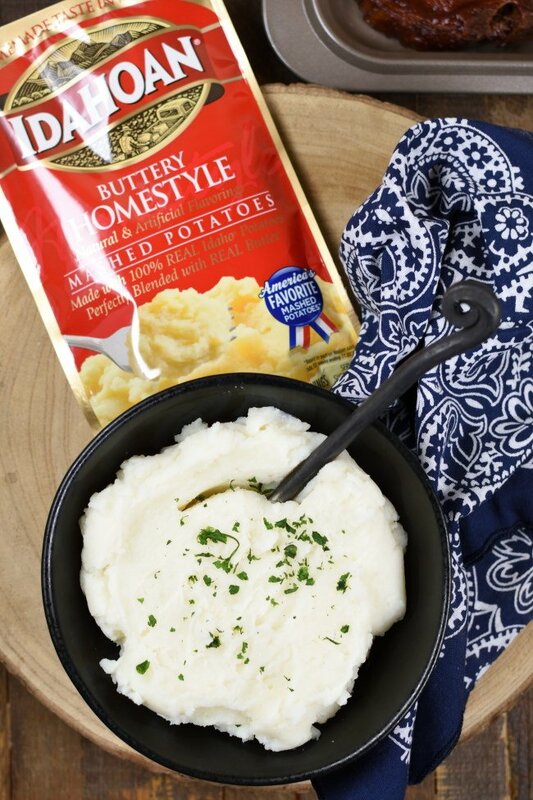 Adding these creamy mashed potatoes to the side is a quick way to complete the meal! Thanks! It’s such an easy, and comforting meal! I am sure my family will love this! Looks perfect! 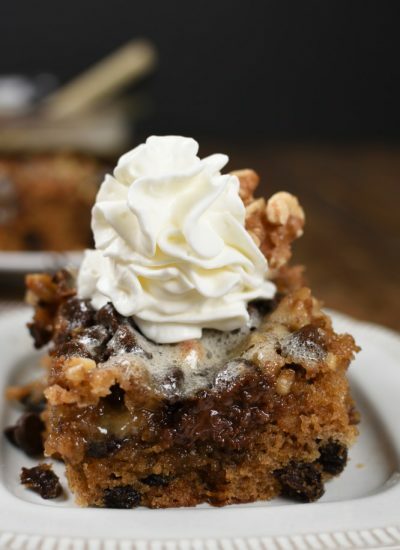 It’s such a great family friendly recipe! Kids always gobble it right up! Yay! I’m glad you enjoyed them! 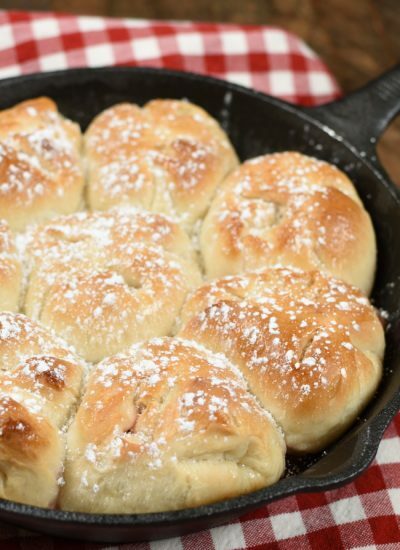 These are a weeknight favorite because they are so easy!